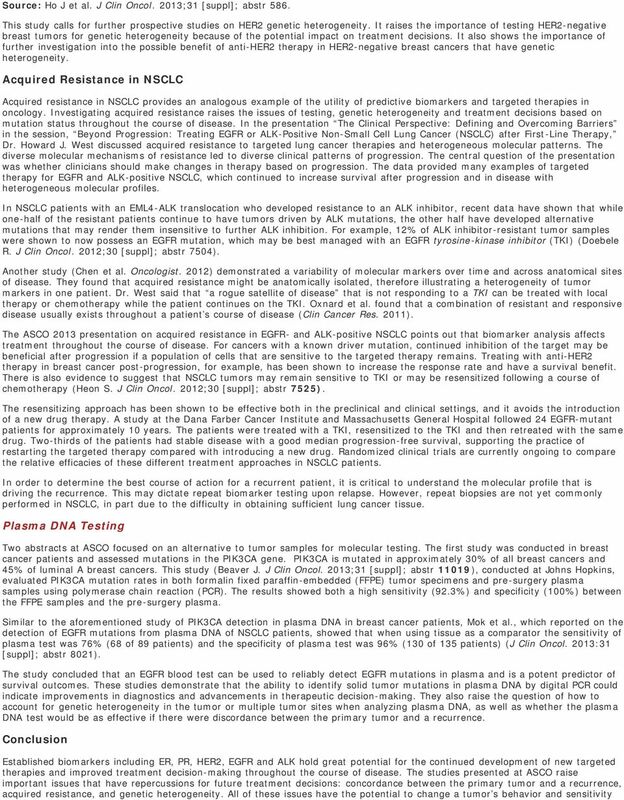 Download "Breast and Lung Cancer Biomarker Research at ASCO: Changing Treatment Patterns"
1 July 2013 Edition Vol. 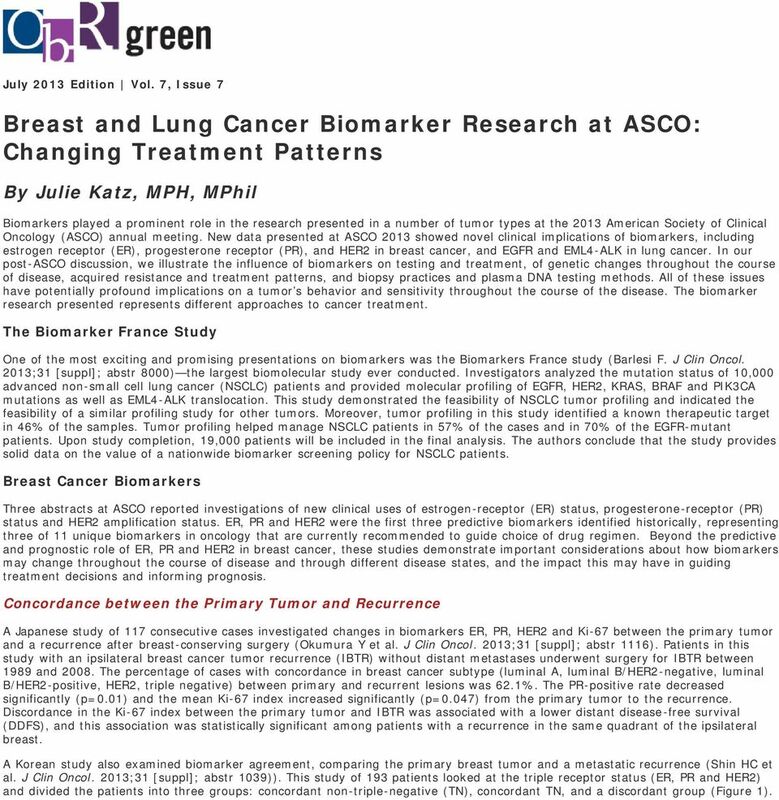 7, Issue 7 Breast and Lung Cancer Biomarker Research at ASCO: Changing Treatment Patterns By Julie Katz, MPH, MPhil Biomarkers played a prominent role in the research presented in a number of tumor types at the 2013 American Society of Clinical Oncology (ASCO) annual meeting. New data presented at ASCO 2013 showed novel clinical implications of biomarkers, including estrogen receptor (ER), progesterone receptor (PR), and HER2 in breast cancer, and EGFR and EML4-ALK in lung cancer. In our post-asco discussion, we illustrate the influence of biomarkers on testing and treatment, of genetic changes throughout the course of disease, acquired resistance and treatment patterns, and biopsy practices and plasma DNA testing methods. All of these issues have potentially profound implications on a tumor s behavior and sensitivity throughout the course of the disease. The biomarker research presented represents different approaches to cancer treatment. The Biomarker France Study One of the most exciting and promising presentations on biomarkers was the Biomarkers France study (Barlesi F. J Clin Oncol. 2013;31 [suppl]; abstr 8000) the largest biomolecular study ever conducted. Investigators analyzed the mutation status of 10,000 advanced non-small cell lung cancer (NSCLC) patients and provided molecular profiling of EGFR, HER2, KRAS, BRAF and PIK3CA mutations as well as EML4-ALK translocation. This study demonstrated the feasibility of NSCLC tumor profiling and indicated the feasibility of a similar profiling study for other tumors. Moreover, tumor profiling in this study identified a known therapeutic target in 46% of the samples. Tumor profiling helped manage NSCLC patients in 57% of the cases and in 70% of the EGFR-mutant patients. Upon study completion, 19,000 patients will be included in the final analysis. The authors conclude that the study provides solid data on the value of a nationwide biomarker screening policy for NSCLC patients. Breast Cancer Biomarkers Three abstracts at ASCO reported investigations of new clinical uses of estrogen-receptor (ER) status, progesterone-receptor (PR) status and HER2 amplification status. ER, PR and HER2 were the first three predictive biomarkers identified historically, representing three of 11 unique biomarkers in oncology that are currently recommended to guide choice of drug regimen. Beyond the predictive and prognostic role of ER, PR and HER2 in breast cancer, these studies demonstrate important considerations about how biomarkers may change throughout the course of disease and through different disease states, and the impact this may have in guiding treatment decisions and informing prognosis. Concordance between the Primary Tumor and Recurrence A Japanese study of 117 consecutive cases investigated changes in biomarkers ER, PR, HER2 and Ki-67 between the primary tumor and a recurrence after breast-conserving surgery (Okumura Y et al. J Clin Oncol. 2013;31 [suppl]; abstr 1116). Patients in this study with an ipsilateral breast cancer tumor recurrence (IBTR) without distant metastases underwent surgery for IBTR between 1989 and The percentage of cases with concordance in breast cancer subtype (luminal A, luminal B/HER2-negative, luminal B/HER2-positive, HER2, triple negative) between primary and recurrent lesions was 62.1%. The PR-positive rate decreased significantly (p=0.01) and the mean Ki-67 index increased significantly (p=0.047) from the primary tumor to the recurrence. Discordance in the Ki-67 index between the primary tumor and IBTR was associated with a lower distant disease-free survival (DDFS), and this association was statistically significant among patients with a recurrence in the same quadrant of the ipsilateral breast. A Korean study also examined biomarker agreement, comparing the primary breast tumor and a metastatic recurrence (Shin HC et al. J Clin Oncol. 2013;31 [suppl]; abstr 1039)). This study of 193 patients looked at the triple receptor status (ER, PR and HER2) and divided the patients into three groups: concordant non-triple-negative (TN), concordant TN, and a discordant group (Figure 1). 2 Source: Shin HC et al. J Clin Oncol. 2013;31 [suppl]; abstr The study compared long-term outcomes, systemic recurrence-free survival (SRFS), overall survival (OS) from primary and OS from metastasis. The highest OS rate from primary was among the concordant non-tn group, followed by the discordant group; the concordant TN group had the lowest OS rate from primary. Similarly, the OS rate from metastasis was highest among the concordant non-tn group. However, the OS rate from metastasis was not significantly different between the discordant group and the concordant TN group. The relative risk of 2.5 (95% CL: 1.2 to 5.3) among the discordant group showed it to be an independent prognostic factor for death after metastasis. These studies raise important questions about biomarker testing during the course of disease and treatment. Biopsy and biomarker testing at recurrence may be necessary to detect a change in the biomarker status of the recurrence compared to the primary tumor and could influence patient prognosis and treatment decisions. These data provide further support for the National Comprehensive Cancer Network (NCCN) recommendation to retest patients who were negative or unknown at initial biomarker testing ( Accessed June 25, 2013). Genetic Heterogeneity In addition to the breast cancer studies that examine the concordance and discordance between primary breast tumors and recurrence and survival, an abstract from the National University Cancer Institute of Singapore examined the prevalence of genetic heterogeneity of HER2, concordance or discordance within the primary tumor, and its impact on survival (Ho J et al. J Clin Oncol. 2013;31 [suppl]; abstr 586). The 158 primary breast tumor specimens in this study had similar distribution of HER2 status to SEER data. This study used immunohistochemistry (IHC) and the HER2:CEP17 ratio to classify tumors as HER2 genetically heterogeneous, according to the ASCO-CAP (College of American Pathologists) guidelines. The definition of genetic heterogeneity was 5% to 50% of tumor cells with a ratio of more than 2.2. 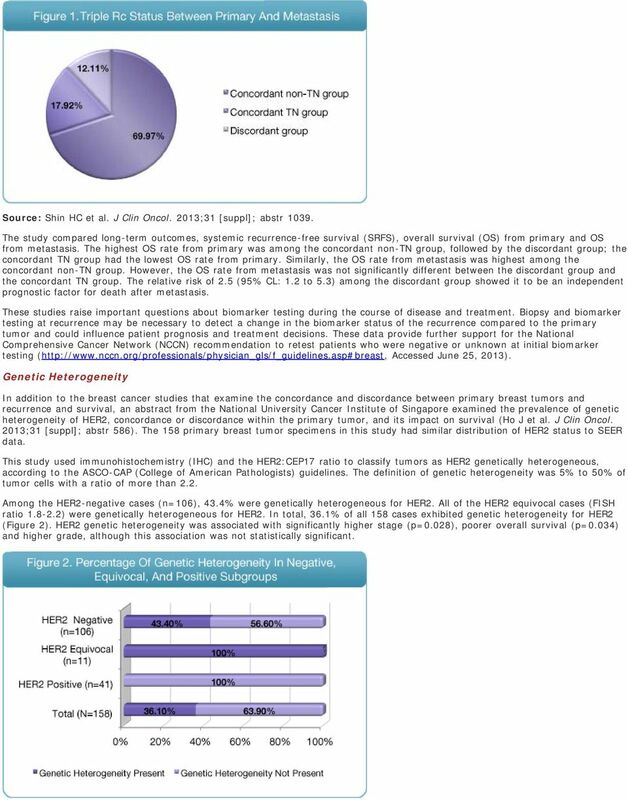 Among the HER2-negative cases (n=106), 43.4% were genetically heterogeneous for HER2. All of the HER2 equivocal cases (FISH ratio ) were genetically heterogeneous for HER2. In total, 36.1% of all 158 cases exhibited genetic heterogeneity for HER2 (Figure 2). HER2 genetic heterogeneity was associated with significantly higher stage (p=0.028), poorer overall survival (p=0.034) and higher grade, although this association was not statistically significant. 4 throughout the course of the disease. Changes over time may dictate vastly different approaches to treatment that should be considered. These studies also raise important questions about companion diagnostics when and how often should the testing occur? Are we using the appropriate testing cut points for HER2, for instance? What is the acceptable and clinically meaningful level of agreement between plasma DNA testing and tumor DNA testing in order to establish plasma DNA as a surrogate tissue for biomarker testing in the case of PIK3CA? When re-biopsying a patient s tumor, should multiple disease sites be biopsied to best understand discordance and heterogeneity? In many cases no evidence-based treatment approach for patients resistant to initial targeted therapy exists. However, it is clear that the impact of biomarkers on treatment will continue to grow and improve the capacity to provide targeted therapy to cancer patients safely and effectively. While over 300 biomarkers are currently recommended for use in oncology across all indications, only 25 of them directly influence treatment decisions (predictive and prognostic guide decision to treat) Predictive biomarkers in many tumor types including KRAS in colorectal cancer, BRAF in melanoma and EGFR in NSCLC are now influencing treatment decisions. Biomarkers for diagnosis and predicting risk of developing disease are common in several disease states, including autoimmune disease, diabetes and cancer. However, biomarkers that are predictive of response to a specific drug therapy are most developed within oncology. Heterogeneity of molecular mechanisms to drive tumor growth establishes the rationale for individualizing treatment decisions and utilizing targeted therapies. The extent and speed with which predictive biomarkers are growing in use in oncology makes this an especially significant therapeutic area. The five types of oncology biomarkers, their function in oncology and the number (n) of biomarkers in each category are shown in Table 1. Figure 3a illustrates the rapid growth of the development of predictive biomarkers in oncology in recent years. Figure 3b shows that an increasing percentage of cancer lives are affected by biomarkers. 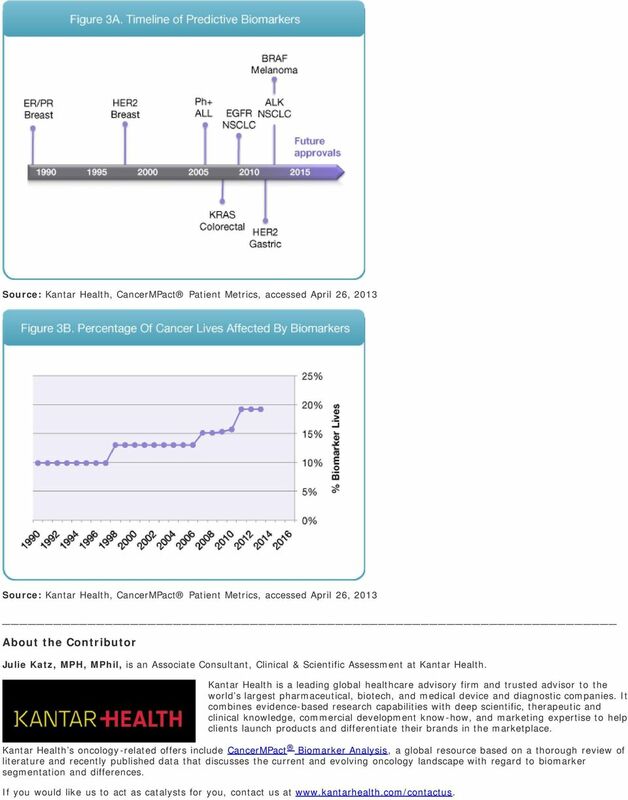 Kantar Health analysis estimates that approximately 800,000 cancer lives are affected by predictive biomarkers, and this number is expected to rise in the coming years as new biomarkers and targeted therapeutics are discovered and established into practice. Prognostic and Predictive Factors in Oncology. Mustafa Benekli, M.D. How can we generate economic value from personalized medicine and big data analysis? Receptor conversion in distant breast cancer metastases. Breast cancer metastases: A spitting image of their primary? Chemotherapy or Not? Anthracycline or Not? Taxane or Not? Does Density Matter? Chemotherapy in Luminal Breast Cancer: Choice of Regimen. HER2 Status: What is the Difference Between Breast and Gastric Cancer? Metastatic breast cancer represents an incurable condition associated with an average survival time of 18 to 24 months.